On a highly anticipated drum corps opening night, the Madison Scouts, under relatively new leadership and in front of a hometown crowd made up of many Scouts' alums, scored a 67.75 to win the Music in Motion show last night in Middleton, Wis. The Blue Stars perform last night in Middleton. Bob Wall, executive director of the Madison Drum and Bugle Association (the umbrella organization that runs the Madison Scouts, Southwind and Capital Sound), was pleased with the Scouts' performance last night. "Overall, the writing and design shows promise. The designers did a good job. The attitude of the group shines out. They're ready to perform. They're champing at the bit to get on the field. They wanted to be out there performing," Wall said. "They all had smiles on their face in the parking lot, and that's all that counts," Wall said. 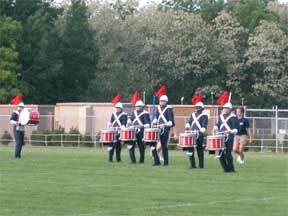 The Colts, who scored 62.75 last night, also performed well, according to Colts' percussion caption head Ryan Thomas. "It went pretty well. There were a couple shaky moments, but they had a lot of energy. It was a good first show," Thomas said. Lauren Ripley, director of Capital Sound (the corps scored 52.05), said, "We did really well! It was an exciting first show. The members were full of energy and adrenaline. The crowd reacted wonderfully to the show. All the applause moments were there. The kids had a blast." Ripley cited Capital Sound's mellophone line for having turned in an exceptional performance. "Our mellophone line did a phenomenal performance last night. The marching wasn't there yet, but it was a solid first performance." Ripley's remarks were seconded by Wall, who also said that Capital Sound had performed well. Wall estimated that more than 500 people attended the contest. "Everybody was very excited to see the first drum corps show," Wall said. Thomas agreed that the crowd was appreciative. "The stadium was about three-quarters full. It was a good crowd. They cheered loud," Thomas said. Despite a slippery field that caused some performers to slip, Wall said, "It was a beautiful night for a drum corps show." Wall not that despite the presence of a few mosquitoes, the sky was clear and the temperature was in the mid-60s. Wall said the audience was eager to see how the Scouts would perform under the new leadership of director Sal Salas, who took over the corps in October. "Everyone seemed to be saying, 'The news guys are in charge now, lets' see what it looks like.' They were very pleased. And the Madison board of directors was applauding." The Madison Scouts' 2003 program, "Gold, Green and Red: The Music of Benoit Jutras," features music written by the French-Canadian composer, who has also composed music for the international film "Journey of Man" as well as for Cirque du Soleil's phenomenally popular programs "Quidam" and "La Nouba." The Colts' 2003 program is entitled "Symphonic Visions: Ritual, Song, and Dance," and it features "A sampling of Western cultural and musical practice in the common era, viewed through the prism of current trends in compositional technique and the color and pageantry of modern drum corps," according to a Colts' press release.